I have always loved cardinals. For one, we have many of them at the farm. They also have the most vibrant red plumage, set off by their yellow beaks. Their song is chipper and distinct. It is more than that, though. They always seem to fly into my view in full wingspan, forcing me to not only notice them, but to take note. AHAmoment. I do take note. 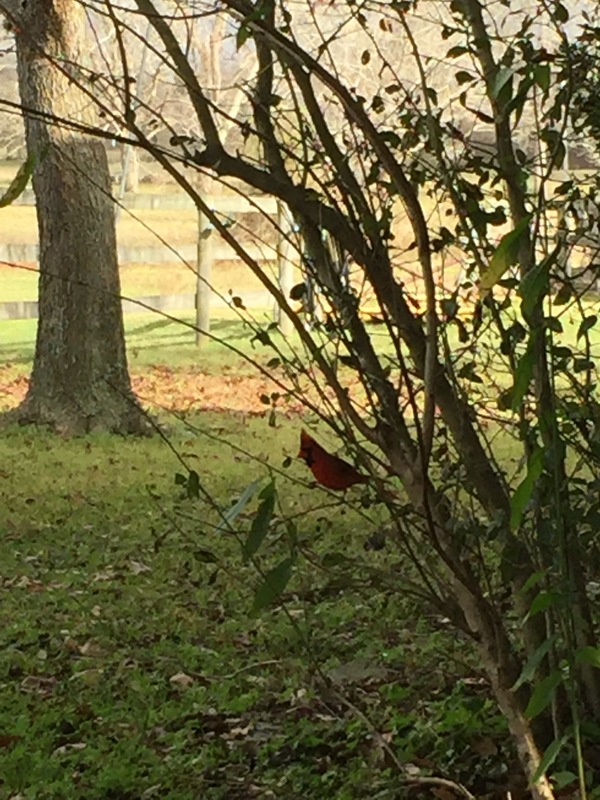 I saw a cardinal at the farm today. To me, it was and always will be a God wink. I had been feeling anxious all morning. Not quite sure why. I was yet again de-buring all the horses’ manes in preparation for Cousin S and her daughter to come out (I really need to go chop those plants down). Not so ironically, none of the horses wanted to stand still for me. Chance in particular was giving me the hardest time. It frustrated and confused me at the time. This was not normal behavior. I wasn’t getting what they were trying to show me, dense human that I am. I was sitting on the deck later stuck in my circular thinking when I saw him. It felt like someone snapped at me in my face. I watched and listened until he flew to a different tree. I walked away feeling completely different. What do you always see as a God wink?